After a long time spent in development and rigorous testing, we’re pleased to introduce our complex SEO analysis service. You can access the service from our main page, from TOP ratings and from many other site pages. Here is an audit example. 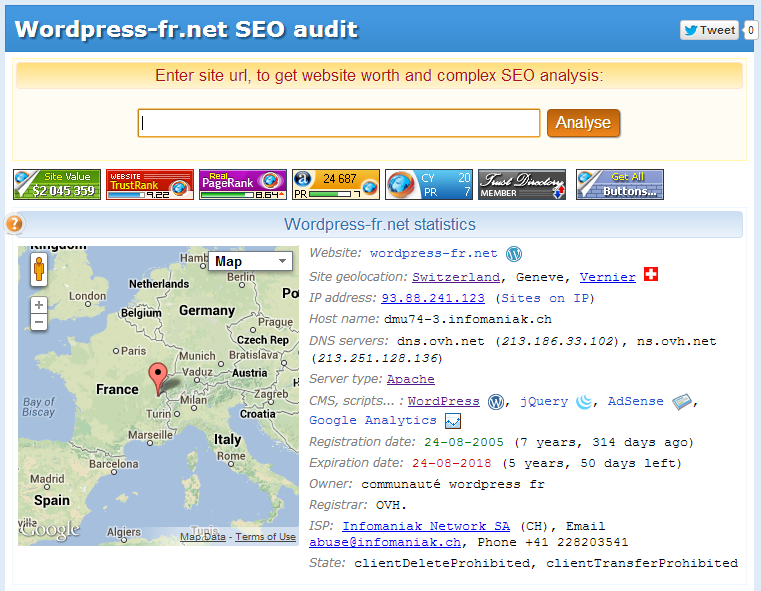 Visit, for example the home page of the site, enter your site address into the form and press the "Analyze" button. Results of the analysis usually appear in 10-30 seconds. In rare cases, it may take up to a minute. For each analyzed site there's an individual page address, which you can visit (or put a link to) later, without any analysis. I. The first thing you'ill see is the Site statistics block. Above the block there's a line of ratings buttons of the analyzed site. Often, just this info is enough to understand what the website presented on the page is. On the left-hand side of the block there's the site location on the map. On the right-hand side, there's the site specifications: geolocation, type of server software, CMS, registration date, registrar, ISP and so on. 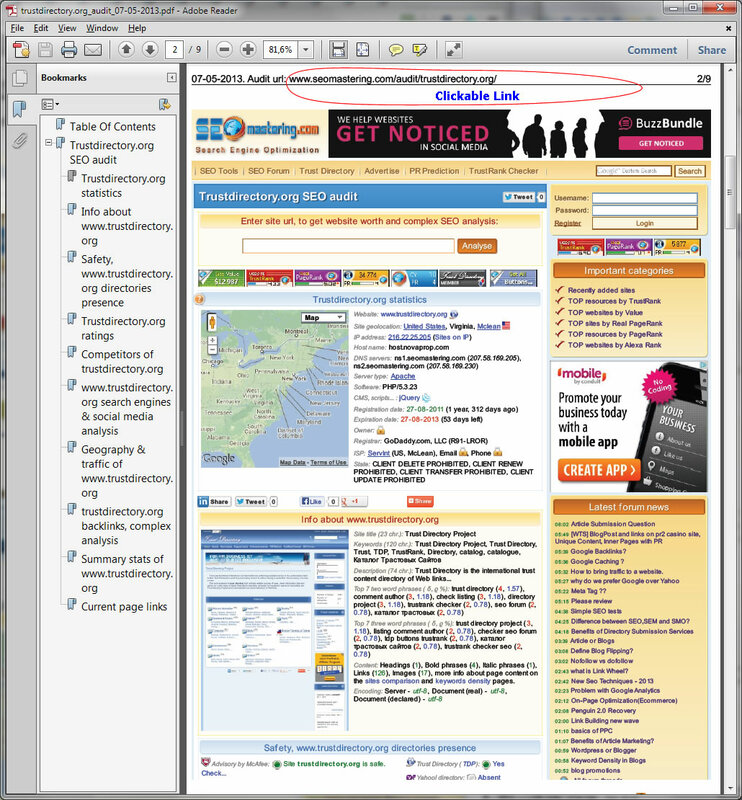 Note, "CMS, scripts" paragraph shows site content management system and scripts, used by the page. Audit tool can detect about 60 CMSes and more than 100 different scripts. If a content management system has been detected, its name links to this CMS Top sites. Pay attention to the ISP line. You will find out not only the name of the hosting company, but also its email and contact phone number. This is an additional navigation menu via the audit page. The analysis page is very large, and often it's inconvenient to scroll through it all, to get to a particular block. The navigation menu will help you with this. The question icon and navigation menu are in the same place on the screen: that is, they are scrolled with the page. Therefore, menu access is very simple. Using the menu links, you can easily move around the page. You can close the menu by clicking anywhere on the document or on the question mark. 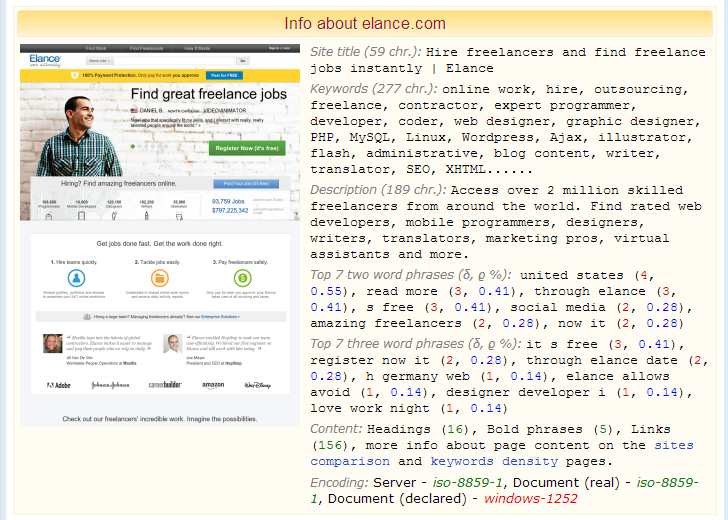 mainly the site title, description, word frequency, important text fragments and so on. Also, there are links to services where you can take a more detailed analysis of the internal factors. 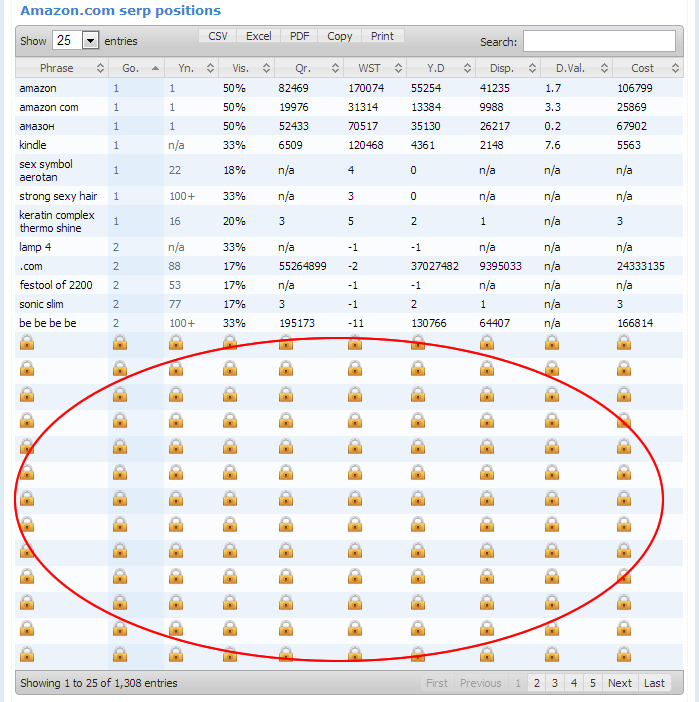 There's an important part at the bottom of the block, where page encoding is specified. If there is no declared encoding on your site, or it does not coincide with the real encoding, it will be highlighted with a red color. On the right side of the report, there's resource presenting in the most important Internet directories. Often, it mentions the authority of the site. Sometimes it's not true. On the left side of the report, there's site security info - verification by the major antivirus software such as Google, McAfee SiteAdvisor, Yandex and Doctor Web. To test the latest one, click the "Check..." link. The window will pop up with a detailed safety analysis of the site. To see a full report of each included page file, you need to scroll the window. This is probably one of the most important blocks. Webmasters often have issues as to whether to have a deal (e.g. buying links, advertising, other cooperation) with owners of certain resources. you will know the approximate cost of the site, its TrustRank, real and nominal (toolbar) PageRank, Yandex CY and Alexa Rank. Rating values link to the TOPs of certain ratings. Our service considers only the current characteristics of the resource. It doesn't consider effort (financial and moral) expended, personnel, budget, offices and other real estate, stock market activity (e.g., for Google and Yahoo), the subject of the site or your personal capacity, etc. Only current, at the moment, are the characteristics of the site. The service keeps track of ratings statistics. On the charts you can see the historical changes of the nominal and the real PR, TrustRank, CY and site value. Graphics are scaled. You can drag them to pan, double click to zoom (or use the mouse scrollwheel). There are also ratings widgets that can be placed on your website. By placing widgets on your site, you'll be able to show your visitors the authority of the resource, its worth, various ratings, and so reinforce the confidence of your users in the seriousness and longevity of your project. You can select button codes, placed on the Analysis page, or you can pick up (from several dozen) more suitable buttons on the widgets page. This section presents site competitors. The most important of them are shown in the table with PR and CY buttons. To see all (up to 1000) website rivals, unfold the link below the table. VI. 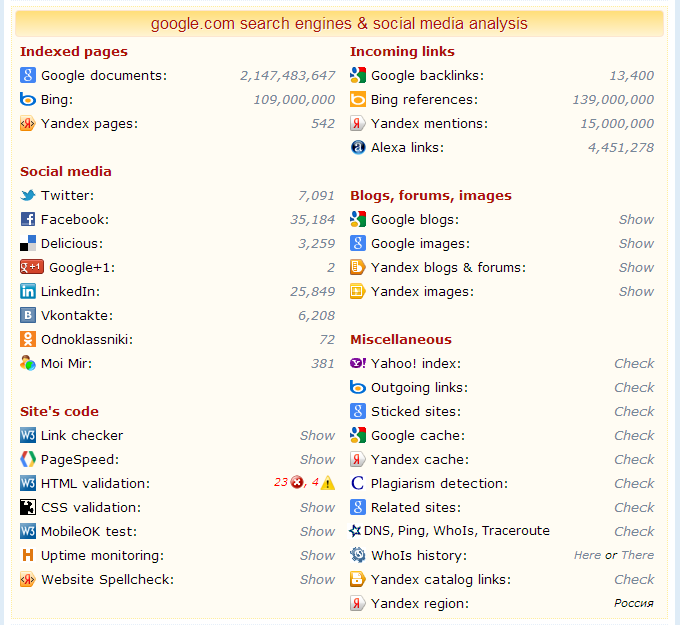 Search engines & social media analysis. In this block, there's a lot of very important information about site indexing, backlink numbers, social media presence, validity, uptime monitoring and so on. Advice: become familiar with this unit and check each parameter of your site. You'll definitely be surprised and learn many new and interesting things about your website. This presents various maps and traffic graphs. Really, only a website owner can know the exact site audience. However, using a variety of data sources, you can make a rough picture of the site's traffic. This is especially important when you are going to place advertising. Please note the fact that this section has more than a hundred graphs. In order to not inflate so monstrous report page, we have created the ability to view different graphs using various checkboxes and drop-down lists. It's recommended that you try them all. Note that some graphs can be generated in comparison to your competitors. That is, you can see the relative traffic of various resources. This section provides details on incoming links of the site. Presents a lot of graphs, as well as detailed information about referring domains, links quality, nesting levels, subnets, donors coefficient and so on. Note that some graphs can be generated in comparison to your competitors. Also pay attention to the last line of the block from Solomono - Site spammy links, measured on a scale from 0 to 100%. When the mouse is over the result, you will see an explaining hint. There's also a color (and graphic) indication, depending on the result. 0 - 10% . Excellent. Spammy factor is based on data from Solomono (indexed pages, domain acceptors), our TrustRank and several refinement coefficients. Please note that the data from Solomono is not always accurate, so this option is recommended only as an evaluation, not as the ultimate truth. Presents donors, acceptor pages, anchor text, donors CY, noindex and nofollow attributes. Here you can see your site's queries and its SERP positions. Links are clickable. Also presents other characteristics of key phrases: visibility, the number of queries, frequency, effective displays, the cost of promotion. In this table, the most suitable keywords for your site are chosen. Indicates the relevance, cost and frequency of requests. All three tables can be ordered and deployed with a different entry number (from 25 to all). When you hover the mouse over the title of a column, there'll be a tooltip that explains the meaning of the information provided. Tables can be copied to the clipboard, saved in CSV, Excel and PDF formats, and printed. There are special buttons at the top of the tables. There's a search field in each table, so you can quickly find the desired information in the table. X. Last block: Current page links. There's separate page, with a unique address, for each analyzed site. This section provides links to the current page in different formats: that is TEXT, BBcode and HTML formats. Copying links, you can easily place them on any resource in order to present (link to) the ready-made results of the audit. After that section, there is the Save audit as PDF link. It works only for registered users, others will be asked to register. By clicking on the link, there will be a PDF audit report generated. Please note that the analysis page is slightly different for registered and unregistered users. Some information is hidden by padlocks. By clicking a padlock you'll be redirected to the forum registration form. After registering, the padlocks will disappear and you'll receive the full information (provided by the service). There's another limitation for unregistered users: no more than 10 analyses over 24 hour period. In addition, the service generates a plurality of sections and auxiliary pages. XI. Widgets page for placing them on your site. Analysis pages already have five buttons for placing them on your website, but they can be unsuitable for your site design. Therefore we developed dozens of buttons for almost any website design. You can choose the most suitable informers by copying the button code for the ones you want. The link to the widgets page is on the main site menu. 6. Presence in the Trust Directory (if listed, or it can be added). Widgets are updated automatically each time you do a site audit. So, you do not need to change the button code once you place it on your site. It will be updated automatically. Why do you need to place widgets on your website? By placing widgets, you'll be able to show your visitors the authority of the resource, it's worth, various ratings, thereby reinforcing the confidence of your users in the seriousness and longevity of your project. Resources are ordered on a first analysis basis. That is, recently analyzed are presented first, and vice versa. 2) TOP by site value. Websites are sorted by approximate cost. Resources are ranked by level of confidence in the search engines. 4) Top by Real PageRank. Sorted by real PR, rather than nominal (toolbar). Very important indicator of links weight. 5) Top by Alexa Rank. Traffic rating, according to Alexa service. Ranged by Yandex Rang and CY. Sorted by content management systems. 13) Top based on IPs. On the analysis pages, in the appropriate fields and columns, there are links to the top sections of certain ratings. 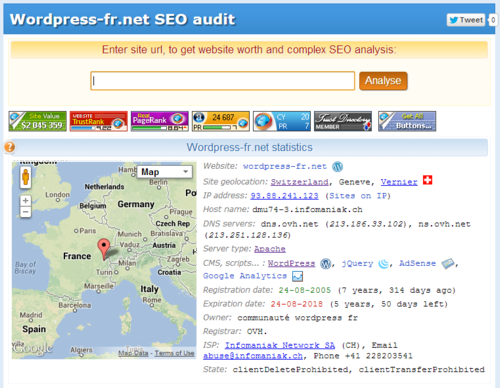 For example, the service can detect if your website is powered by WordPress. In the column, where it's indicated, there is a link to the top section with sites rated by this engine. You can see the comparative characteristics and understand why some sites are ranked higher than others. There are links to some top sections in the main site menu. That's it with our service presentation. We hope our service won't fail you. We also hope it will help you better understand the current state of your site, as well as how effectively you promote it. Please view the slide show as a brief reminder of all of the above. To view click on the image below. We look forward to your comments, feedback and suggestions regarding our service. Thx for the great seo tool.The new tool is very good,bug it can't check the website which is offline.I suggest to open trustrank checker singlely. I come back after 8 months on seomastering.com and absolutely incredible tool now. I'm speechless to say about this tool. Lots of changes you made it in audit tool. I had faced many trouble with trust rank checker. Now, The Issue has been resolved. Amazing Sevam. The tool is great, however I guess the # of visitors that this tool showcases is not close to reality. I have different numbers from google analytics and far less number from seo mastering. May be someone can take a look at that. why message:" Resource is inaccessible. Try again, entering a site address in the form above. "?